A Journal Entry on Travelling and Preconceptions. The first sight seen as we drove from Penang International Airport towards our hotel was a sign that said “Penang, Pearl of the Orient.” It was my first time visiting the Malaysian island, my wife has visited two years earlier for the country’s very first Tropfest film festival, and the stories she told me of Georgetown, the capital of Penang, as a city where the colonial architecture, peranakan heritage, and modern urban culture clashed and collaborated, intrigued me. 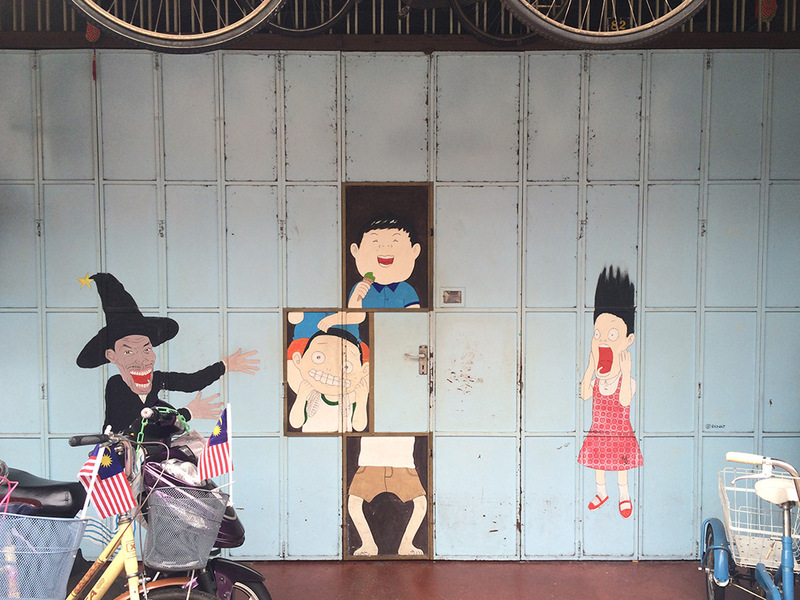 We arrived at about 8 pm and as we sat in the back of the minivan the shophouses, apartment buildings, and highways that we passed were reminiscent of a Jakarta suburb, though the traffic was noticeably less hectic. 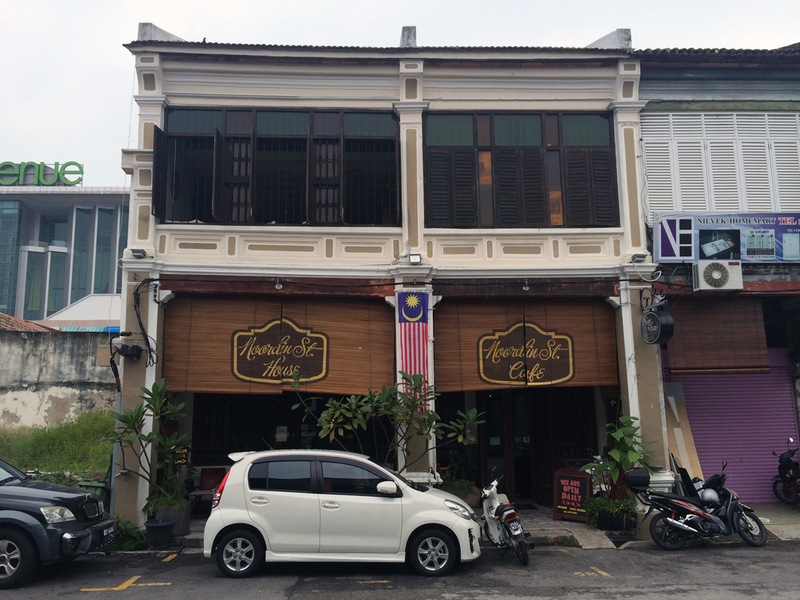 Our driver mentioned that we have arrived during a long weekend as monday, August 31st is Malaysia’s Independence Day, and so the traffic will be smooth throughout our stay as many residents have left town for vacation. 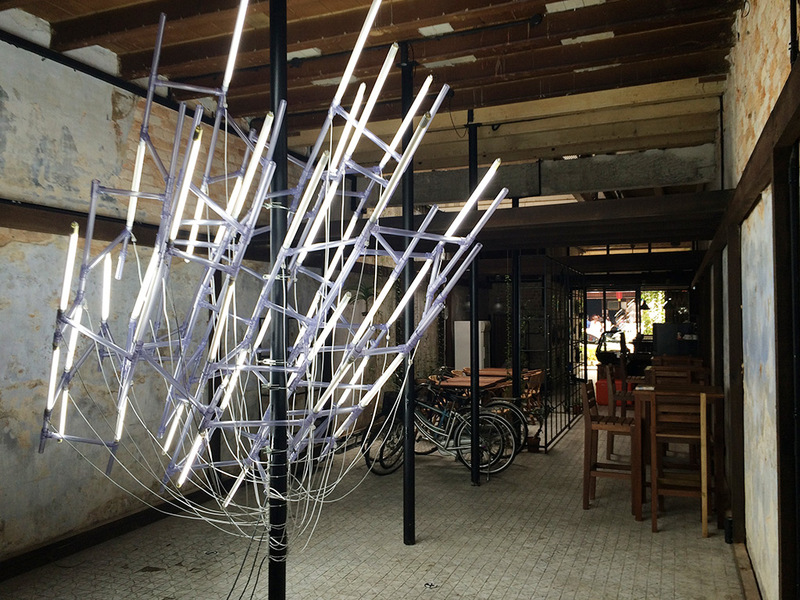 This was a surprise, as the weekend was to be the final day of the Georgetown Art Festival, a monthlong festival filled with exhibitions and performances. Nonetheless, the break from Jakarta’s often stand-still traffic was welcomed. 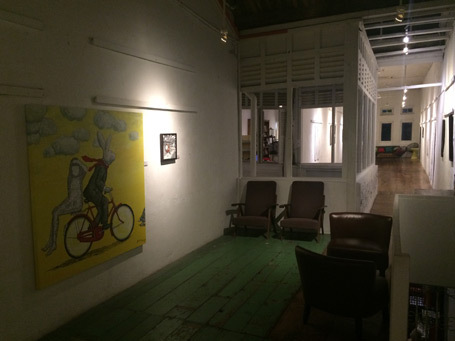 Our hotel, Noordin Street House, is a small and charming converted shophouse sitting comfortably in Noordin Street, which is located a little bit outside of Georgetown’s art centre of Armenian Street. As charming as our hotel was, we couldn’t wait to go outside and explore, so after settling in our room and a quick change of clothes we walked outside at about 9 PM looking for dinner. After a few minutes of walking around the rather dark and empty neighborhood, we found a hawker center and decided to eat there. The food was reminiscent of hawker centers in Pluit, with dishes that included swee kiaw, pork floss, dim sum, and glass noodles soup. While eating my bowl of Hokkien prawn mee and waiting for my wife to get her yam cakes, I took time to turn my head to observe my surroundings, and realized that in our particular neighborhood, the people cooking in the stalls, people eating at their tables, and the few motorcycles and cars that passed were the only source of activities. After finishing our food, we walked a large radius of our neighborhood, passing businesses that would only be open during the day, and stopping to see people preparing for the Hungry Ghost Festival and Mooncake festivals, with makeshift altars and giant incense offered to spirits and deities being prepared in multiple neighborhoods. 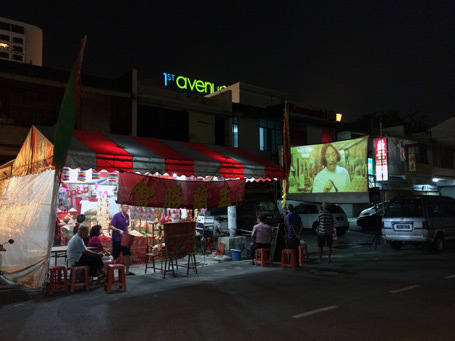 One particular shrine intrigued us, located across the street from a Chinese praying supply store, an altar was being prepared, and as entertainment for the neighborhood a giant screen was being projected a Stephen Chow film. As it was late at night, it was a delight for myself to see leisurely activities, and after a moment of people watching as well as attempts to decipher the film’s scenes, we headed back to our hotel and called it a night. 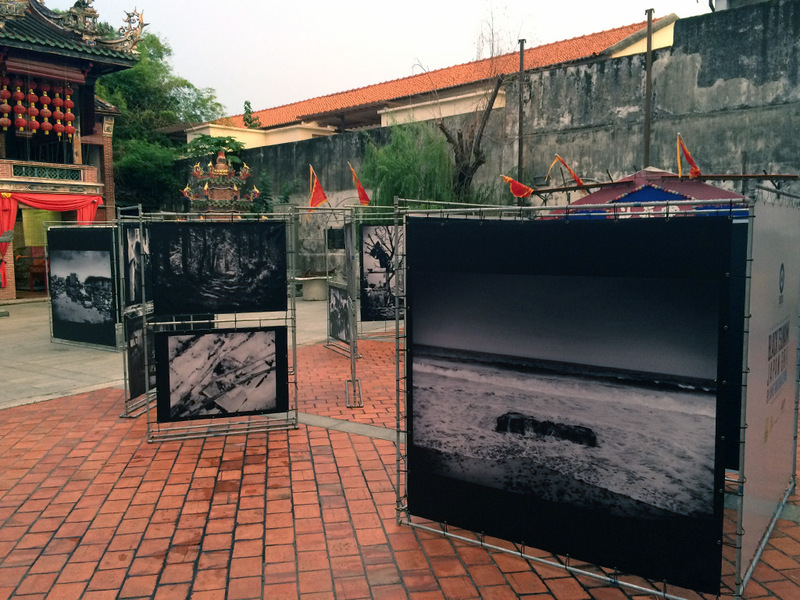 Watching a film while preparing a shrine on Noordin Street. 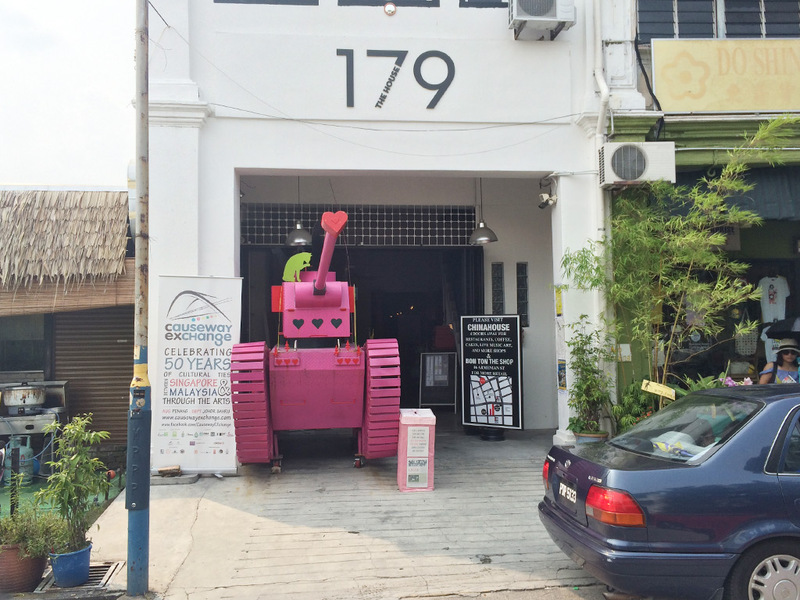 In the next day, after eating a hearty continental breakfast we decided to explore north of our hotel, to see the Little India and Love Lane, a strip filled with cafes and quirky hostels, which apparently also borders the UNESCO world heritage site. 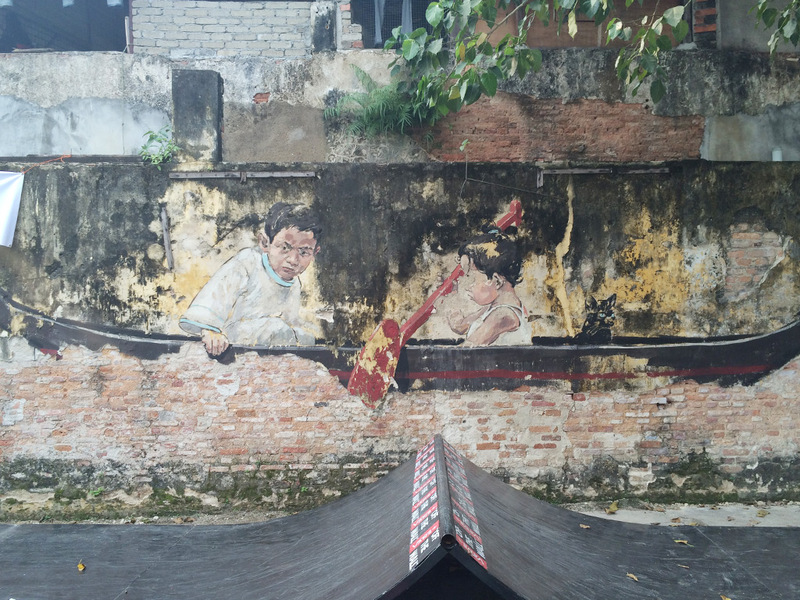 The surrounding architecture was beautiful, with colonial Peranakan buildings making up the majority of the city, and the though the activities were sparse, it was a pleasure to watch the cooks prepping the ingredients at hawker centers, tourists taking pictures at the many beautiful street art found on the city walls, and the locals going about their day. 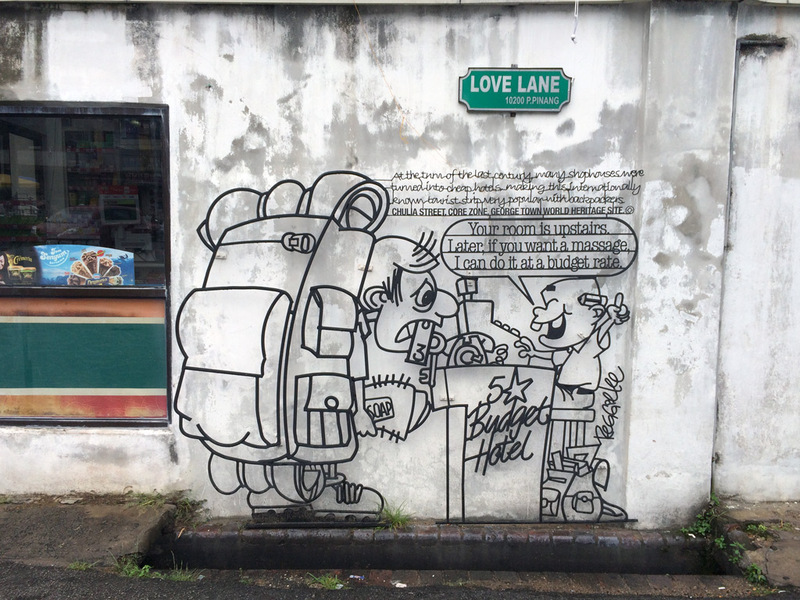 After a few hours of walking and sweating profusely due to the heat and humidity, we headed back to the hotel for a short rest and a quick shower, for later in the evening we planned to visit the Armenian Street area, where much of the Georgetown Art Festival will be. While enjoying a nice view of the neighborhood from our hotel rooftop with a cup of tea and ciggarette, I again thought of the quaintness of the city and it dawned on me that I harbored a sense discomfort in the peacefulness of Penang. 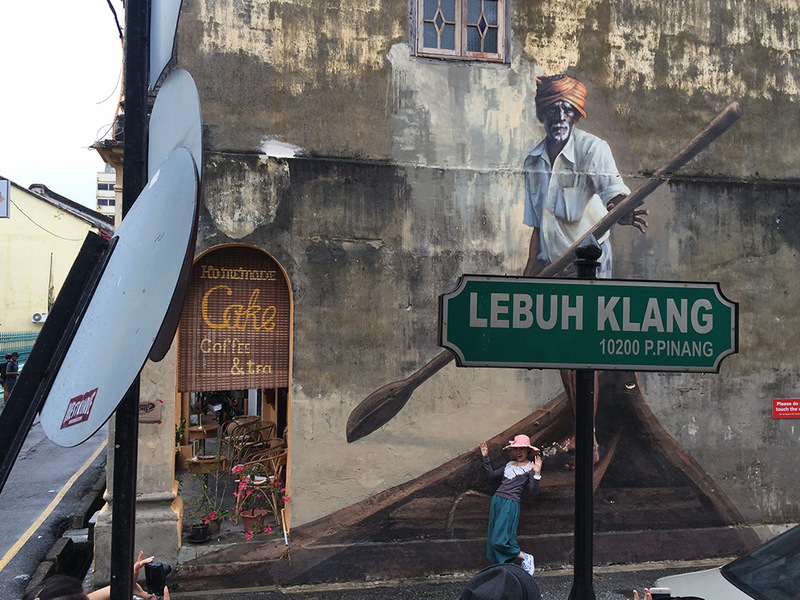 This discomfort isn’t one of dislike or irritation – so far, Penang has been a pleasant experience. What I soon realized was that I have not adjusted to the pace of the city. Partly influenced by my everyday activities in Jakarta, the internet, as well as hearing and reading of people’s Penang stories, there was a subconscious assumption that the sequence of sights and sound were to occur one after the other in relatively quick successions, and this, of course, is never the case. My expectations were like articles in magazines and stories from friends, where parts of a huge amount of information are selected, edited and condensed into a short and compelling synopsis. Real life isn’t simply A to B, it is a sensory experience through space, time and the happenings that occurs from A to a distant point B. This may seem obvious, and in retrospect, I agree, but it wasn’t the case during my first day in this trip – my mind was prepared to receive information at a certain, pre-calculated pace, and my experiences gave me another. 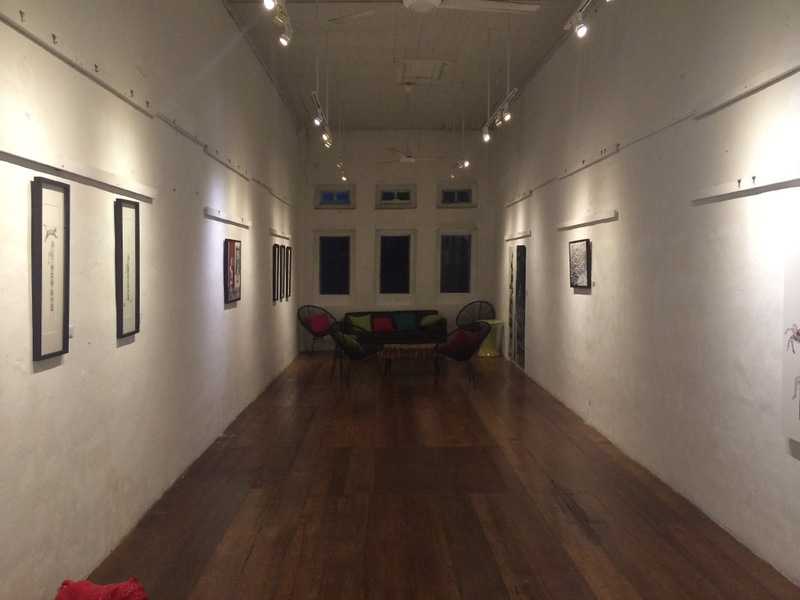 An art gallery on the second floor of China House. At about 10 o’clock at night, we visited the few shops and art galleries that were still open before making our way back to our hotel. 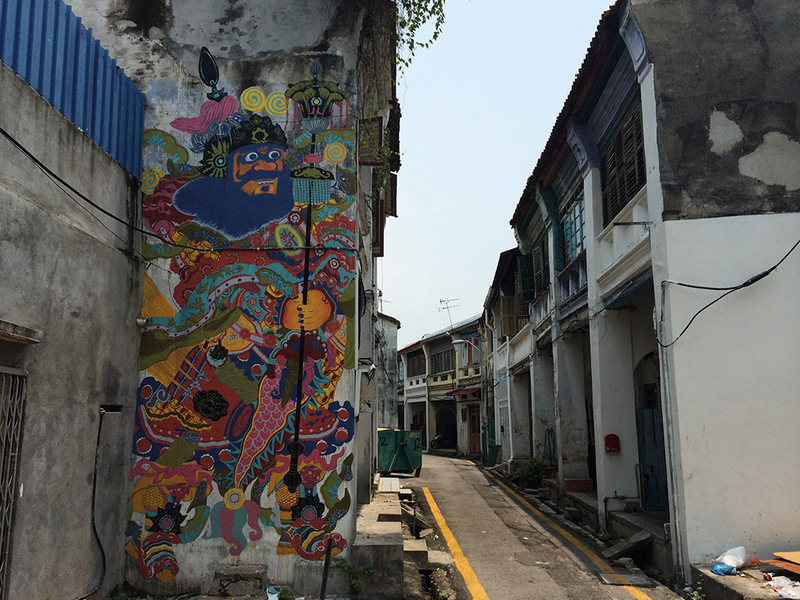 As we travelled further and further away from the colorful Armenian Street, the lights and sounds of Georgetown’s festivities became more distant, and we were enveloped by the quiet shophouses along Beach Street. It was then where I began to really appreciate the unfamiliar and picturesque Georgetown. It isn’t too often when I get the chance to walk down quiet streets filled with rows of colonial Peranakan shophouses, and though there are certainly a number of them in my city of Jakarta, to be surrounded day and night by these pleasantly old fashioned buildings makes for a special affair. 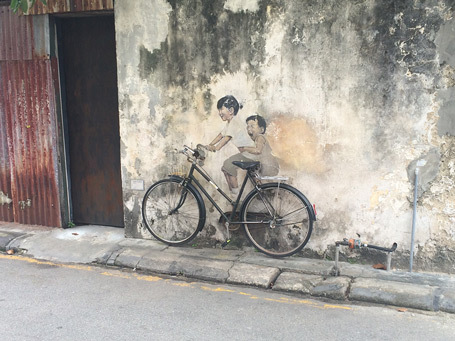 One of the many artworks by Ernest Zacharevic gracing Penang’s walls. Our third day there was Malaysia’s Independence Day (Aug 31), and as we expected most of the businesses to be closed, my wife and I decided to rent bicycles and cruise around Georgetown for most of the day. 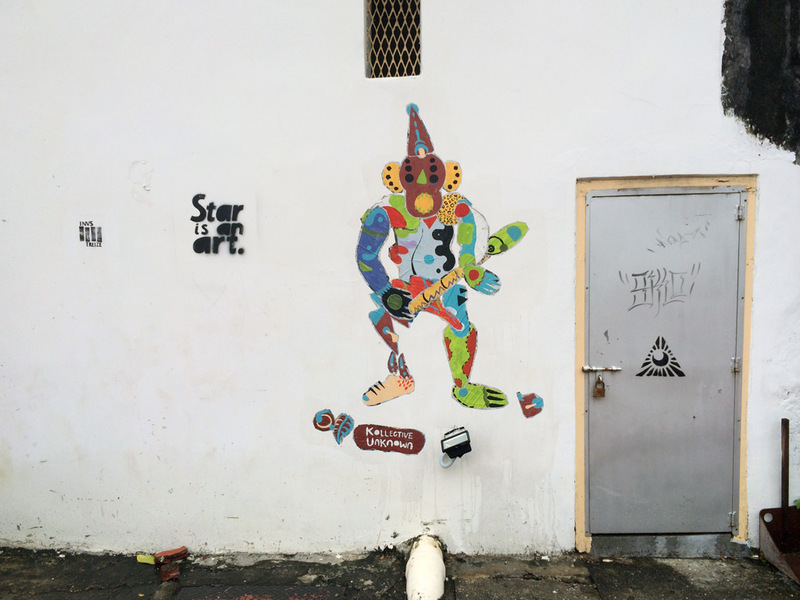 Surprisingly, Armenian Street was still bustling with activities, and in this area we visited more art galleries, a toy museum, and desert places before cycling around the city. The Georgetown is a moderately good city to bike in, although the larger and busier streets are better avoided as the bike lanes are part of the street. 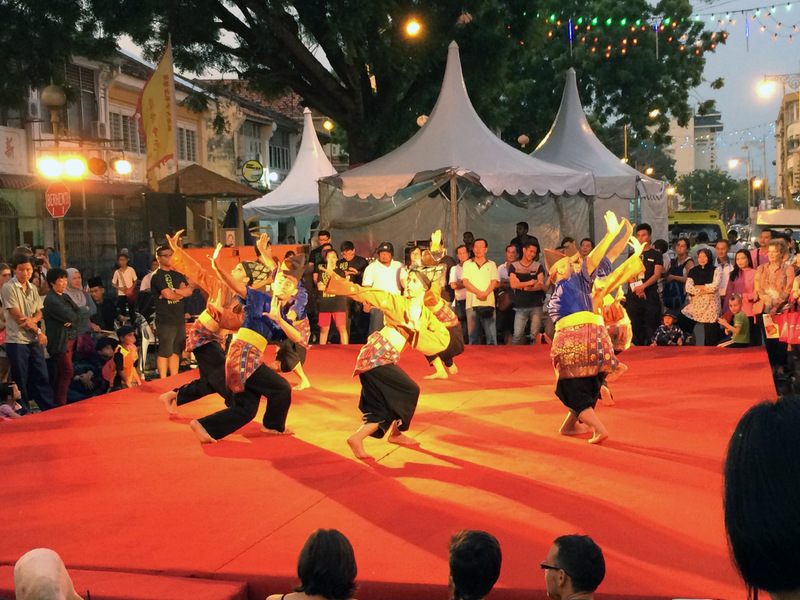 We zig zagged through the neighborhoods, making only a short stop at the beach side of Fort Cornwallis on the northeastern tip of Penang, where a giant park was holding a festival to celebrate the Malaysian Independence Day. As we rode our bikes through the city again the thought of pace entered my mind. At this point, I already felt “in tune” with Georgetown and enjoying what ever this vacation threw my way, but as we rode on those bikes relatively quickly through the city I couldn’t help but feel as though this two-wheeled adventure resembled what I had expected to experience in Penang before. Being able to cover more distance at a relatively short amount of time, we were able to pass by many of the murals, historical sites, and other sites in quick successions. Those moments were fleeting. As we never spent too much time at any individual place, the weren’t much information absorbed. The smells, sight, and sounds weren’t impressed into my memory as they were the previous day as there was not enough time to do so on the bicycle ride. Of course, we could have stopped at individual sites, but we didn’t. This in turn made me think not about my ideas and expectations of Penang, but instead how I process information in my everyday life. As natural as compartmentalising information is, I believe that the brevity in which I conduct my activities and thoughts keep me from absorbing much information, and that often times it leads to a simplified and superficial understanding of what is in front of me. We ended our bicycle tour of Georgetown after eating ko char siew pau pastry at Kedai Biskuit Kek Ming Xiang Tai and walked back to our hotel for a shower after a day’s exercise. 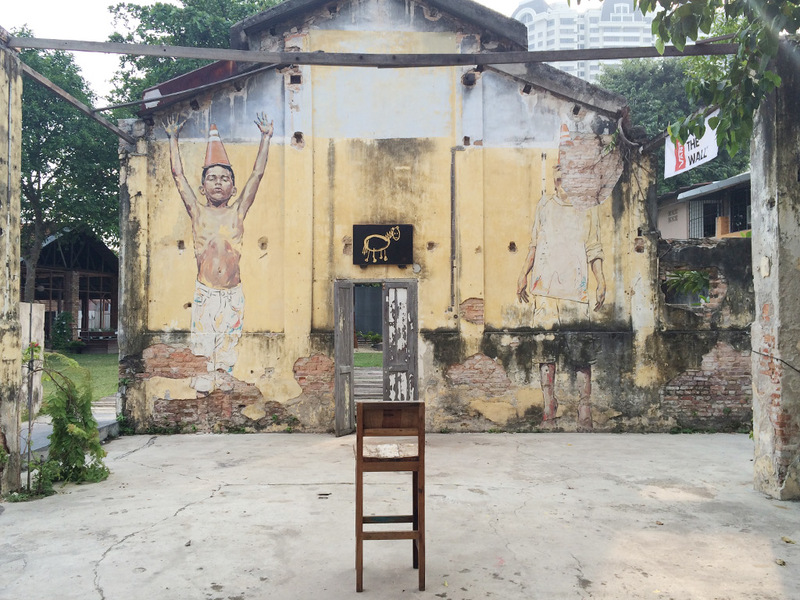 Before arriving at Noordin Street, we stopped by Hin Bus Depot, an abandoned bus depot that has since become an art center after artist Ernest Zacharevic held a solo exhibition there. 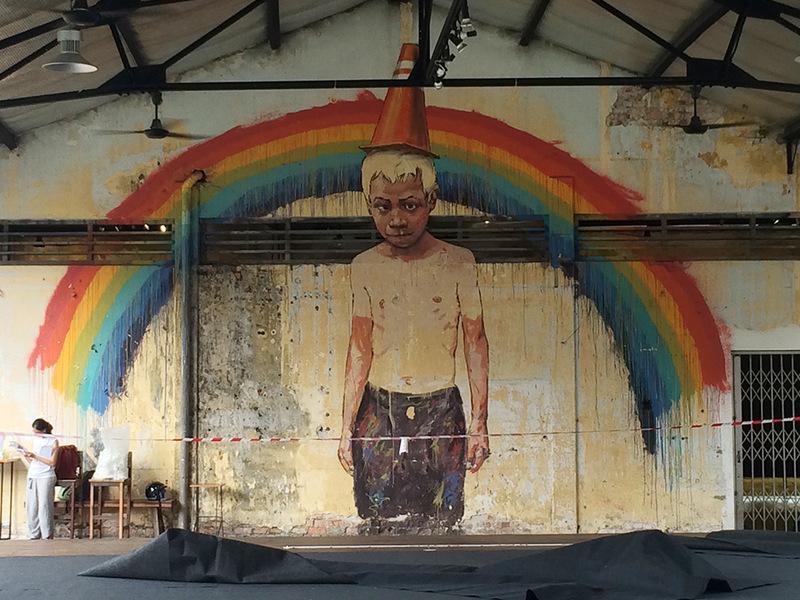 Zacharevic’s murals are still intact, and the area has since become an art center and holds many events, including a skate competition that was held just a few days before our arrival. 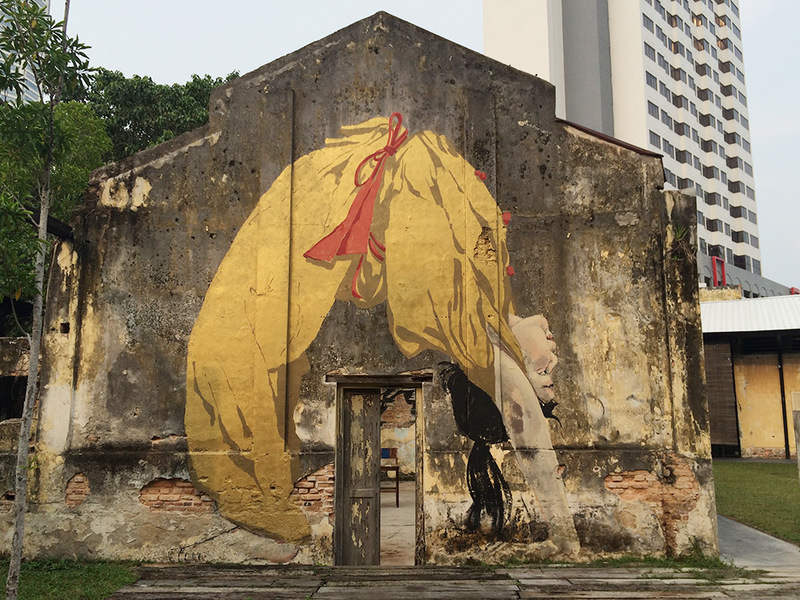 We took our time to see the artworks that grace the abandoned bus depot, and visited the coffee shop and clothing shop that has opened next to it before returning to Noordin Street House. When the sun set, we wanted to eat Nasi Kandar, a rice dish with choices of curry meat that quite famously originated from Penang. 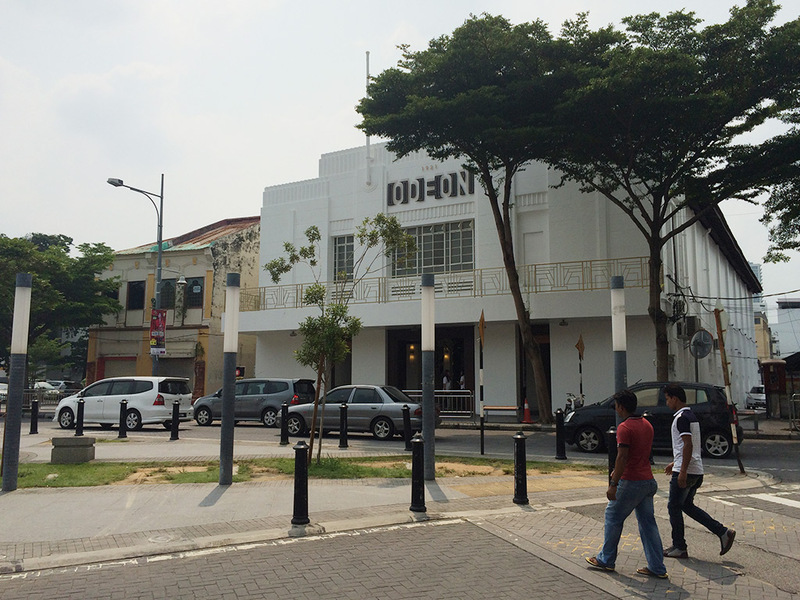 Walking hungrily towards Nasi Kandar Hammediyah, a famous Nasi Kandar shop that has been around for over 100 years, we were met with Hungry Ghost Festival celebrations through out different neighborhoods. 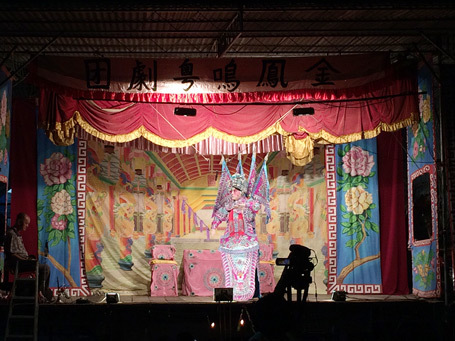 Paper offerings were being burned, giant incense shaped like dragons were lighted up, assorted food offerings were being given, and at one of the places there was a stage where a Chinese opera performance was taking place. After stopping every few shrines along the way, we finally arrived at Nasi Kandar Hammediyah, where the cooks welcomed us and gave us a brief explanation of what nasi kandar is. We ordered the briyani rice with lamb shank and vegetables, and dug into the dish quickly. For me, nasi kandar was very similar to nasi Padang, where the rice is mixed with the meat and curry of your choice. 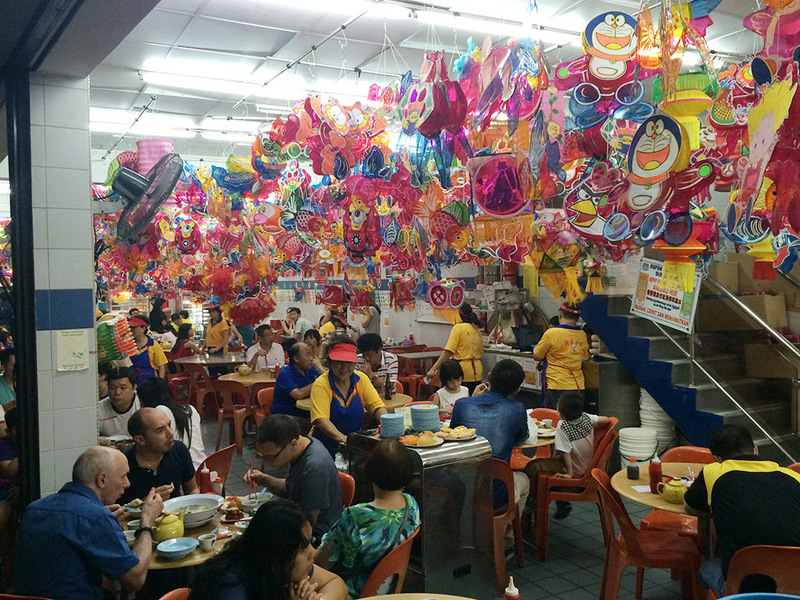 Nasi kandar was much more fragrant, though, the Indian influence is very apparent in the smell and taste of the food. 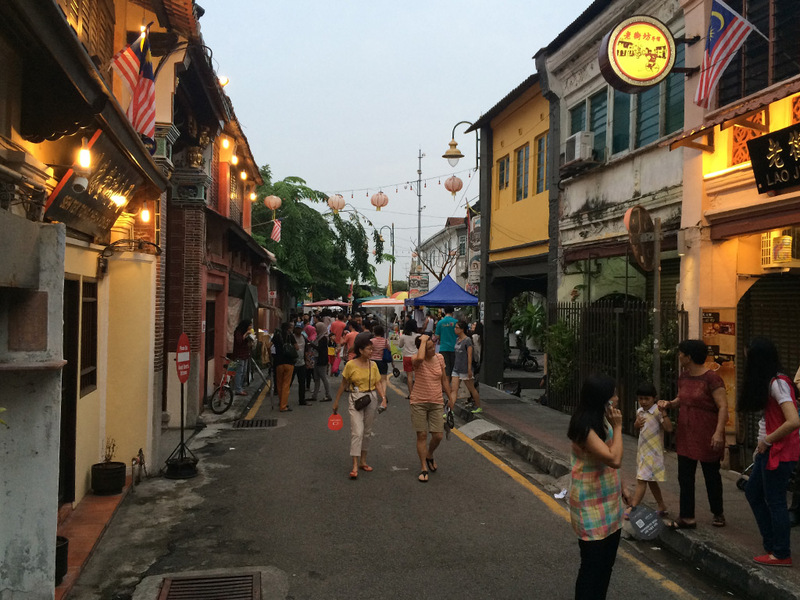 As we walked back to our hotel, we stopped by a few hawker centers just to see the busy food vendors and the dishes they offered, and decided once again to walk in quiet neighborhoods of colonial shop houses. During our final day in Georgetown, we decided to walk around neighborhoods we already visited the previous two days – almost as if summarising our vacation, as well as taking the chance to visit a few places we didn’t get to previously. Not surprisingly, as this was the first regular working day afte the long weekend, more businesses were open and we were able to experience Georgetown in its regularity. 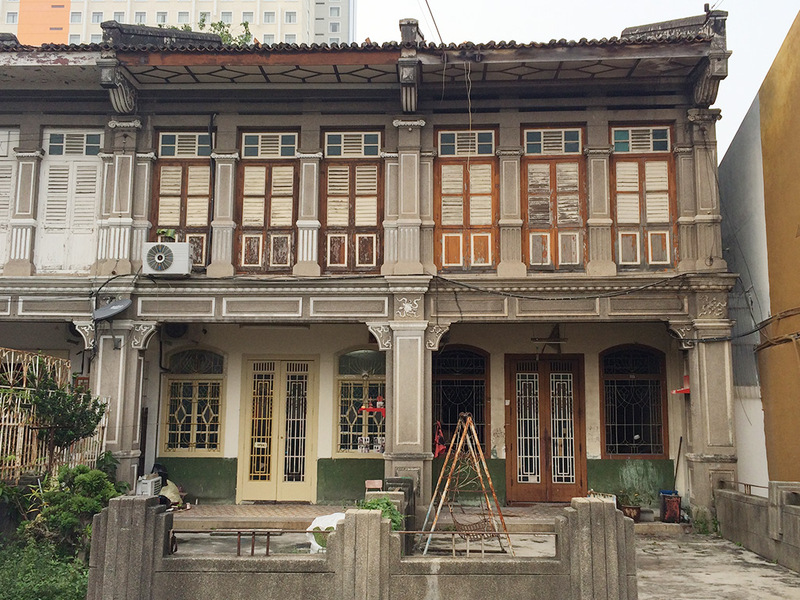 One of the highlights of our final day was a visit to the Sun Yat Sen Museum, a house in Armenian street which was home to the Chinese revolutionary. After a tour of the modest-size home and the history of the things inside of it, the friendly and informative guide Alvin Wong directed us in a fun photo shoot around the house. Other than that, we took our time walking around and enjoyed the beautiful surroundings one final time before departing for Indonesia the next day. 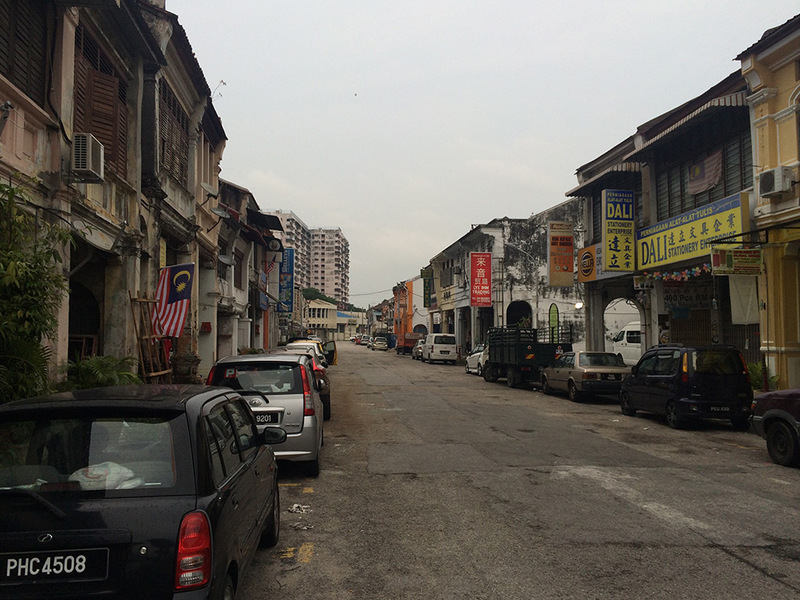 Revisiting the areas we previously discovered, there was much time for me to think about my experience in Penang. This (as you have noticed from reading this Column piece) was a personal journey for myself. 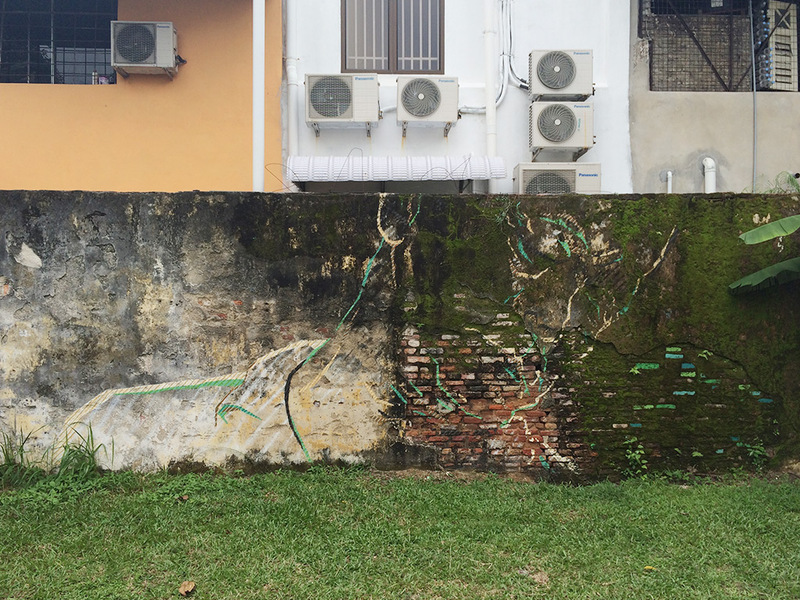 As we are settled in one place and get used to our routines, our minds can become accustomed to one certain way of thinking and approaching circumstances –and it was this vacation in Penang that made me aware of my preconceptions. The opportunity to learn and understand new cultures and way of thought is what I consider to be the most important part of traveling. To comprehend that there are many things that are different and may conflict with our own beliefs is a sobering reminder of our own ignorance and capacity for understanding. My perception unfortunately hindered my ability to fully appreciate Georgetown, but I am glad that my biases were brought into attention, and it means that I will save my money for another visit to the pearl of the orient.